In the early years, Big Data was discarded as yet another fad. Today, Big data has gone from buzzword to business necessity. However, Big data analytics has always startled Small and Medium Enterprises (SMEs) because of the inability of SMEs to fund it. Now, there are many cloud services that enable you to create your own analytics and allow you to scale up your requirement or stop the service when your project is complete, keeping control over the cost. We believe that it is the right time for SMEs to exploit the power of Big Data Analytics. 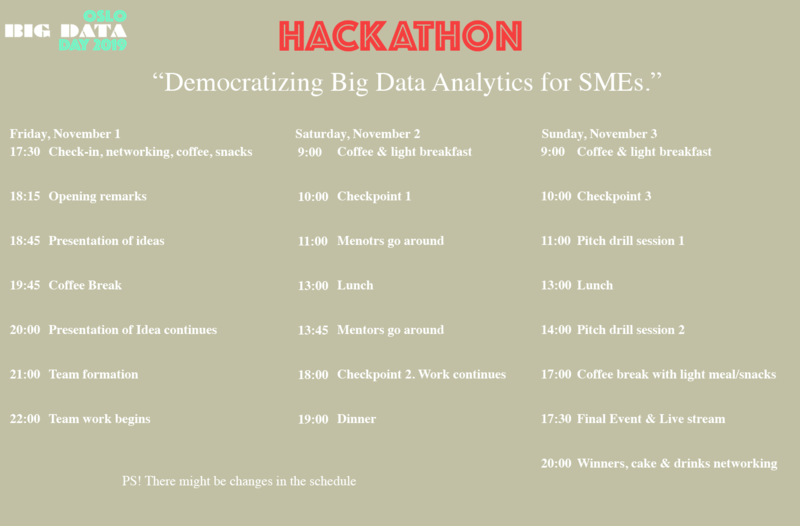 So, join OBDD Hackathon to empower SMEs with Big Data Analytics. This year’s Oslo Big Data Day will feature a 48 hours hackathon event with the theme “Democratizing Big Data Analytics for SMEs”. Full up the participation form here. Program agenda is available below. The winning team will pitch in front of real-life investors during AIM2 SYMPOSIUM on November 7, 2019 and the team will be offered to start a full fletched company. There will be a full-time Master chef on-site along with access to beds and showers throughout the event. If an idea does not get sufficient people, the idea will be dumped and those people and the remaining people may choose another idea or put themselves with other team. A team can have maximum of 8 people. Once you have a complete team, your team will be given a room to work from and you can start working immediately. There will be mentors from different background throughout the weekend to help you with your project.